Just received my parcel 5 minutes ago! And a very fragrant parcel thanks to the sweet peppercorn rub . Had just enough time to "stage" and take a picture. 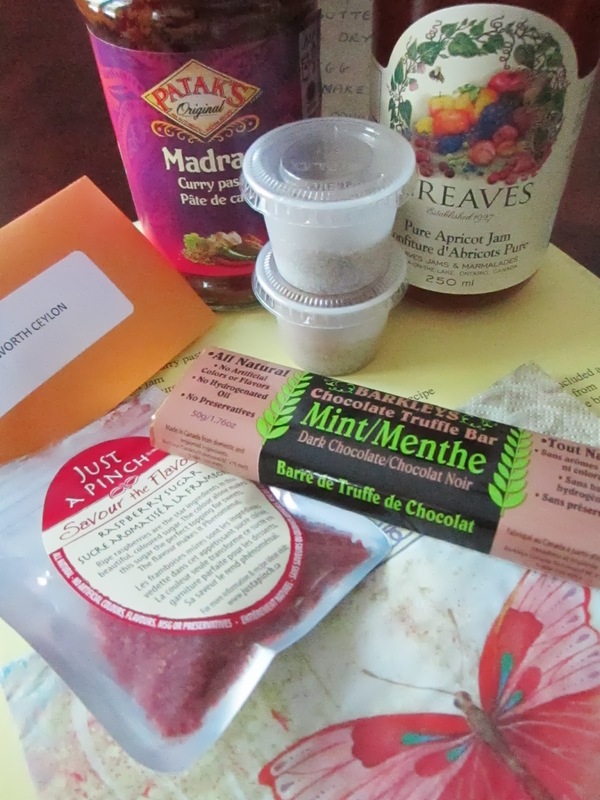 Ali in Toronto sent something for the candy dish-peppermint/ginger chews (interesting flavor combination), tea samples, a corn cob for popping, granola bars, a muffin mix, and the rub. Looking forward to trying everything in the coming weeks. Thank-you, Ali﻿. Lisa sent a fabulous package! I really appreciate the effort that she put it to find a product that didn't contain fish extract. It continues to amaze me the stuff that is in some products sometimes! The recipes are fabulous!!! I love it. I can't wait to use the curry sauce. I LOVE Indian food. I also can't wait to bake the welsh cake and use the jam on it. I love baking. I love the teas and can't wait to try them. I love all kinds of tea! The chocolate bar looks so yummy. I love sprinkling flax seeds and chia seeds on my yogurt. The place cards, labels and napkins just complete the fabulous package. All the effort was much appreciated. It's a great food package. I love Food Pen Pals!